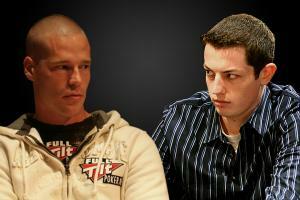 Back in January 2009 online poker superstar Tom “durrrr” Dwan issued an open challenge to the poker community offering them 3:1 odds that he would beat anyone, except his close friend Phil “OMGClayAiken” Galfond, over 50,000 hands of heads-up poker. The rules stated that the stakes had to be at least $200/$400, the game could be no-limit Hold’em or pot-limit Omaha and players had to play at least 75 big blinds deep at all times. If Dwan was up by just $1 after the 50,000 hands he would keep all profits plus $500,000 from the challenger, if he was down by a single dollar he would have to pay $1,500,000 to his opponent. Three world class players showed an interest in the challenge David Benyamine, Phil Ivey and Patrik Antonius, with the latter being the first to lock horns with Dwan. Due to other commitments and the fact there has been a lot of $500/$1,000 games running, the challenge seems to have dragged its feet but in recent weeks it looks as if the two poker giants are wanting to wrap things up and move on. In total the pair have played 33,303 of the planned 50,000 hands and Dwan finds himself with a seemingly unassailable lead of $1,986,418, making him odds on to claim Antonius’ $500,000 bet. It has not all been plain sailing for Dwan who found himself around $500,000 down after 13,000 hands but he rallied well and from hands 15,000 to 18,000 Dwan turned on the magic and managed not only to claw his way back to even but to also take the lead by almost $1,250,000. The swings have been enormous and were there for all to see when Antonius won $750,000 from “durrrr” but since then Dwan has dominated proceedings and now has an extremely healthy lead. Whilst Dwan will remain a hot favourite with casino poker download experts to win this challenge, Antonius has gone on major heaters before and won in excess of $1,500,000 in less than 4,000 hands so he will still believe he has it all to play for in the coming weeks. This entry was posted on Thursday, March 25th, 2010 at 7:57 am and is filed under Poker News. You can follow any responses to this entry through the RSS 2.0 feed. You can leave a response, or trackback from your own site.